Extratropical cyclones present some of the most dangerous weather hazards in the extratropics. Extreme winds and precipitation in the frontal systems of extratropical cyclones result in the loss of life and damage to infrastructure. 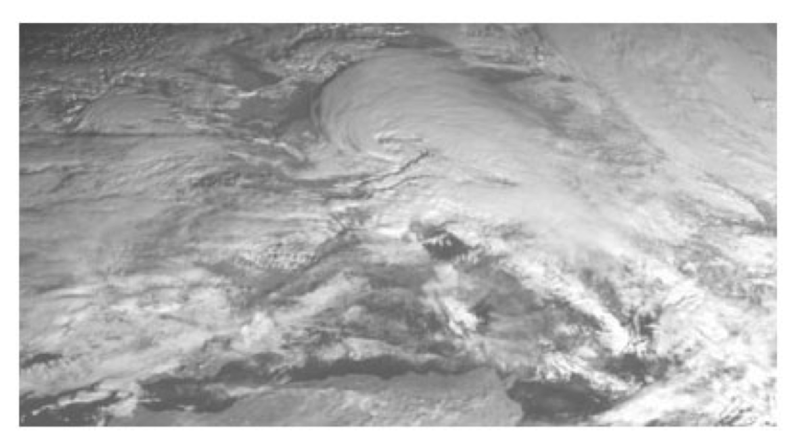 At the same time, extratropical cyclones are one of the primary mechanism for transporting for transport moisture, heat and momentum in the extratropics. Correctly representing extratropical cyclones in climate models is thus essential for the correct simulation of climate. The increased atmospheric resolution of HiGEM should allow extratropical cyclones to be better represented. In particular, the higher resolution should allow frontal processes to be better resolved. Meanwhile, the increased resolution in the ocean should allow for strong gradients of SST (Sea Surface Temperature) to more accurately captured. These strong gradients, such as the Gulf Stream or the Kurishio, play a primary role the location and growth rate of extratropical cyclones. 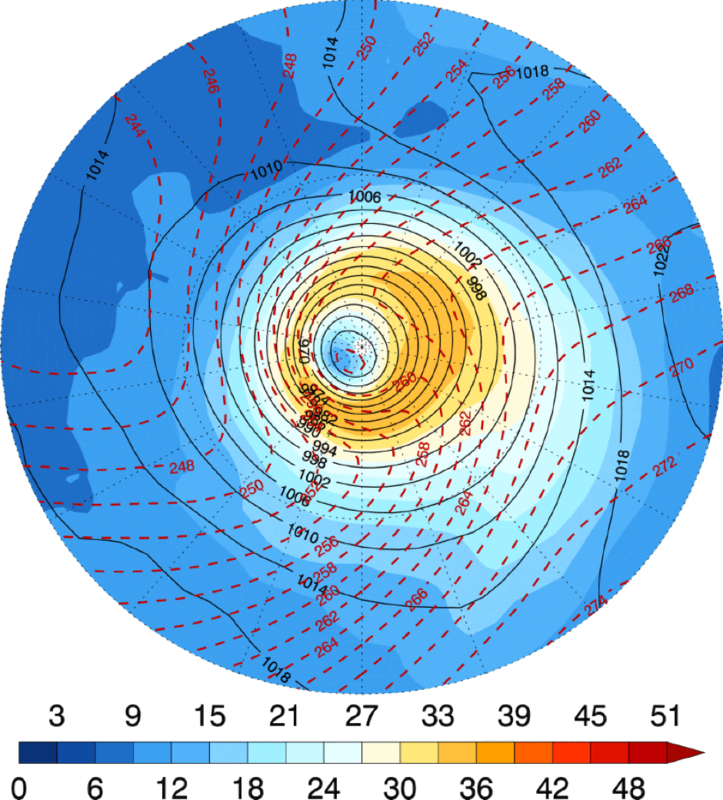 High-resolution models tend to better simulate the probability distribution functions of Atlantic storms compared to low-resolution climate models. Increasing the resolution of the atmospheric model allows the model to represent stronger extratropical cyclones. Another question that needs to be answered in regard to climate change is how well are extratropical cyclones represented in climate models. 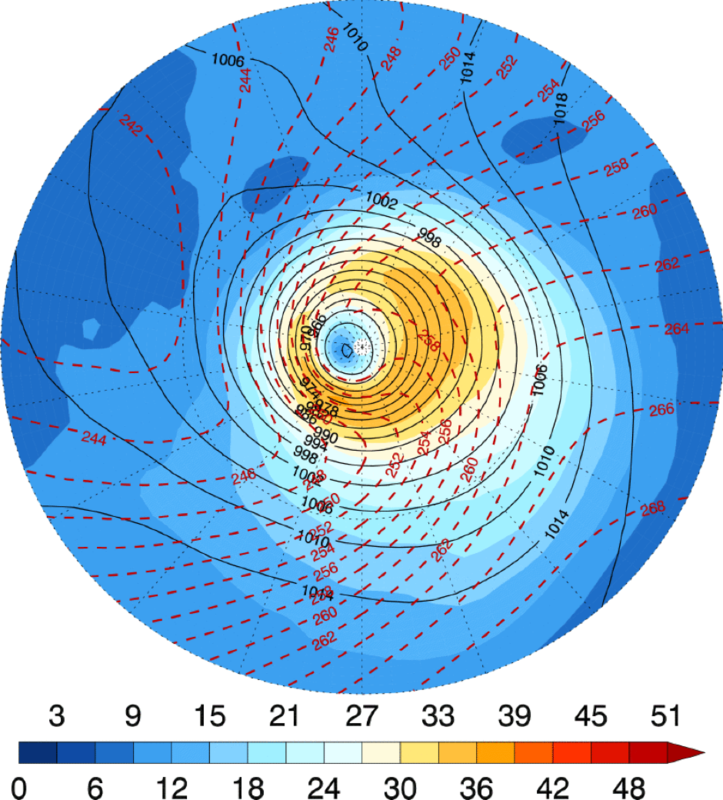 To have confidence that climate models can predict how extratropical cyclones will change in a future climate then it is essential that the structure of extratropical cyclones is correctly represented at climate resolutions. The above figure shows the results from some pioneering work done at Reading University to try and answer this question. Using a feature tracking program to composite extratropical cyclone in reanalysis dataset and the HiGEM, we can compare the observed and modelled structure of extreme storms. The above figure shows that HiGEM (top) can very accurately replicate the frontal structure and spatial pattern of the extreme storms seen in the ECMWF reanalysis (bottom).